Pain is always unwelcome, and the reasons for potentially experiencing it only increase with age, making any distinctions in the pain important to understand. 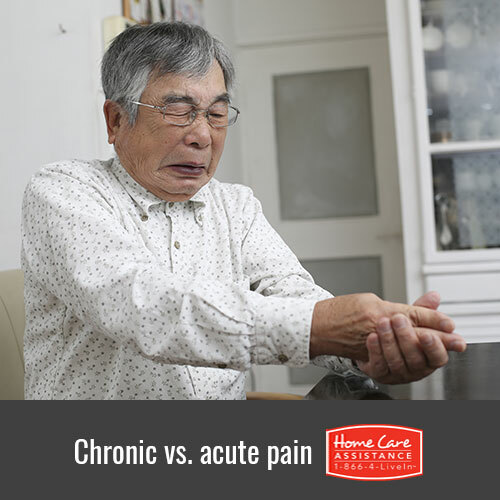 To help your senior loved one better comprehend some of the differences between chronic and acute pain, the staff at Home Care Assistance in Harrisburg has put together this comparative guide. A fast onset with an identifiable cause means your loved one is experiencing acute pain. If the injury that caused acute pain heals and pain is still felt beyond the recovery period, it has then become chronic pain. Chronic pain can last for weeks or months and is usually related to a preexisting or underlying condition. Acute pain subsides upon treatment of the cause, and pain medication may be prescribed to interrupt the signals from nerve endings to the brain. Chronic pain may continue even after the body has healed from injury, making it difficult for conventional treatment methods to help. If the pain is psychological, counseling and therapy may help provide your loved one with techniques to block the pain from his or her mind. A clear circumstance, such as surgery, bone fracture, childbirth and labor, or burns and cuts, is usually the cause of acute pain. Chronic pain occurs with cases of cancer, arthritis, and fibromyalgia, but many other causes of chronic pain may be difficult to understand or diagnose. The clearest function of acute pain is to aid healing. While experiencing acute pain, the body’s nervous system is activated and skeletal muscles spasm to “warn” your loved one of further injury. Chronic pain is considered a disease, and it causes significant, prolonged stress to the body. After an injury, pain systems eventually become less susceptible to the signals from the injured body part, but this does not occur with chronic pain. Though acute pain will typically subside if treated properly, it can be difficult to live a healthy and happy life when experiencing ongoing pain. If chronic pain has affected your loved one’s ability to accomplish daily tasks, a live-in or hourly caregiver in Harrisburg may be just what he or she needs to help manage the pain. At Home Care Assistance, our caregivers are expertly trained in the holistic Balanced Care Method, which promotes healthy senior living by ensuring all physical, emotional, and spiritual needs are met. For more information, call one of our knowledgeable Care Managers at (717) 540-4663 to schedule a free in-home consultation.